After a trip to California, the itinerant exhibition “Le roi Tut, trésors du pharaon doré” is stopping in Paris in La Villette’s Grande Halle. A great exhibition during which you’ll be able to admire exceptional collection of the Grand Egyptian Museum composed of objects, representations, archives and scientific technics that helped learning about Egyptian History. You’ll see more than a hundred objects, golden jewellery, furniture, sculptures and ritual objects among which some pieces had never left Egypt before. 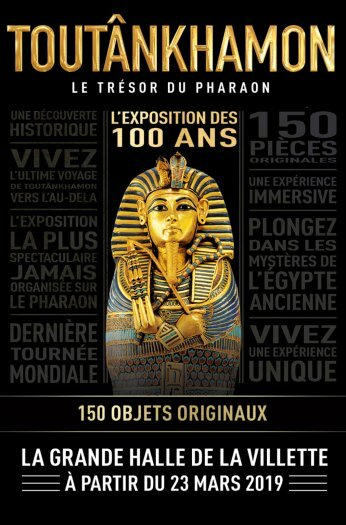 Since 2012, Paris hadn’t had such a big exhibition about Tutankhamun. At the time, it was at Porte de Versailles. Otherwise, it was at the Petit Palais in 1967! You can buy your ticket at the exhibition but we advise you to book it online (see underneath).